Finding fresh recipes for the family can sometimes be a challenge; and experimenting with new recipes can even be downright disastrous. If you have been looking for a break from the mundane, then take a second look in your pantry. Here are two fun, kid-friendly recipes, one sweet and one savory, that you probably already have the ingredients for. Both are perfect for a movie night, entertaining or just quick and satisfying snack. The first recipe is a twist on a classic. 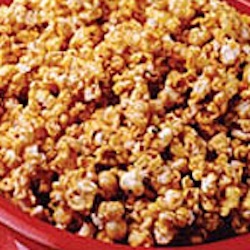 This is probably the simplest recipe for caramel corn I’ve ever come across. It includes pecans for a little extra crunch, but this recipe is fairly versatile so you can make substitutions or additions according to your family’s cravings. If your sweet tooth still isn’t satisfied, try mixing in dried cranberries or white chocolate chips was the mixture cools. Preheat oven to 300°F. Spray 13×9-inch pan with cooking spray. Mix the popped corn and pecans together and pour in bottom of prepared pan. Melt the butter in medium saucepan over medium-high heat. Once melted, add brown sugar, syrup and salt and bring the sauce to boil. Let it boil for about 2 minutes, stirring constantly with wooden spoon. Be careful not to burn the caramel sauce! It can happen quickly, so as soon as the sauce is smooth, remove it from heat. Stir in baking soda into the caramel sauce. Be sure to mix this very well. Pour over popcorn mixture, tossing gently to evenly coat. Bake for 15 minutes, stirring every few minutes. Remove from oven; stir again. Spread onto wax paper to cool thoroughly. The next recipe is for the older family members. If you have a taste for savory treats, you’ll love this recipe! Alter the ingredients to make it as spicy as you like. Almonds and cashews also make great substitutions for the salted peanuts; but if you want to make it a little sweeter, mix in honey roasted peanuts at the very end, before serving. Prepare popcorn and remove all of the unpopped kernels. Place popcorn, corn chips and nuts in the resealable storage bag. Melt the butter and mix in the Buffalo sauce. Pour the sauce over popcorn mixture, seal bag and shake until popcorn mixture is evenly coated. Place mixture into 15×10-inch jelly roll pan and bake for 5 minutes, stirring once. Serve while warm, or store it for later! 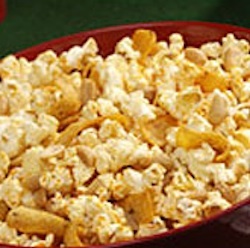 The Caramel-Nut Corn sounds yummy and easy to do!! These are great, especially for habitual snackers like my family and I! I would love the Buffalo Style Popcorn! I really like spicy snacks. The Caramel-Nut Popcorn looks good too of course. I bet that buffalo style corn is really good.